Hi all, we have movers coming on the 27th of Oct and hope to be on a plane for NY on the 3 of November! Details to follow... Meanwhile, instead of packing, we went off for a few days to celebrate our 19th (can't believe it ourselves!!) anniversary. Saw friends in Maun then off to Makgadikgadi National Park. We had been there last year but on the other side of the river in a nice lodge. This year we roughed it and camped, and we're so glad we did! With no rain since April, the dry riverbed, with water being pumped into watering holes attracts most of the game in this region. Like last year, there were thousands of zebra and wildebeest with elephants and hippo aplenty. 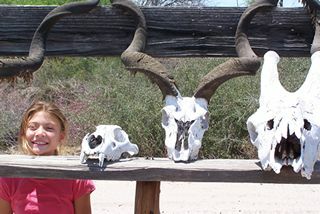 We had not seen giraffe but there must be some since their skulls were on display at the entrance of the park. Convinced there were none, we were pleasantly surprised by two we startled as we rounded a bend. The number of vultures was eerie, particularly now at the end of the dry season when we had to dodge the fallen and what remained of them. 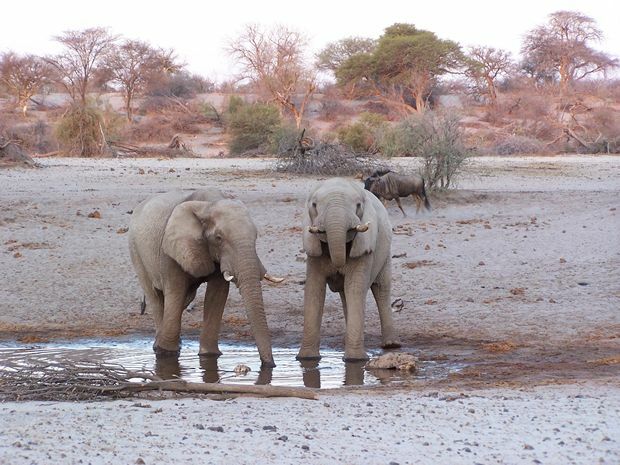 Particularly haunting are the skulls and bones of those who made it to a watering hole, only to find it was unsuitable to drink. One freshwater hole had elephants hogging it for most of the day, only to move off to allow other pachyderms to partake, but not before playfully chasing off brazen wildebeest or zebra. We spent good portions of our time parked in front of this spot, watching the animals interact--all too thirsty to care that we were there. We actually saw the hippo out of the water--something I'd never seen before. They are enormous--Pete informing all of us that it is indeed the second largest land mammal--as an elephant crossed our path, my very observant son asks, "So, what's the first?" Macallan just rolled her eyes. We made it to camp just after sunset and made dinner to the not so subtle sounds of a male lion approaching. His roar came in regular intervals, allowing us to track his progress as he moved along the riverbed warning other male lions to get out of his way. Markham was appropriately scared, wanting to scarf down his springbok steak (we brought it with us. No hunting in the National Parks, silly!) 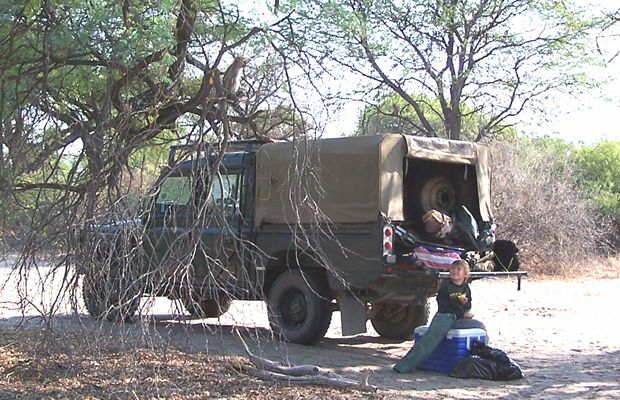 and sleep in the Land Rover. Pete convinced him the lion was far away. I looked at Pete to see if he too believed this and he appeared convinced. I was not. The roars seemed to be getting closer and coming much more often. I, too ate my food quickly and didn't make that one last run to the toilets that is necessary after a day of drinking water for hydration and beer to calm nerves. We went to bed, Macallan snuggled close to Peter, sensing I was nervous and excited by the prospects. Peter, always a bit too blasé for my liking, cheerfully took our camera to bed with him so that he could record the lion entering camp--great! Just great! Markham couldn't get much closer to me and I have to say, I was comforted by his closeness. I even took the liberty of moving him lower in his sleeping bag so that his head wasn't pressed against the side of the tent (you know, just in case the lion starts sniffing around or a hyena hasn't had his fill of dried bones). Pete stirred and I watch him get up. I had not determined that the lion incident was over, but since seconds had lapsed and I heard nothing, I assumed I had fallen asleep for some time and the lion had moved on. Peter starts to unzip the tent. "What are you doing?" I spat out in total panic. "The lion was just here." Pete looks at me and practically whines, "Why didn't you wake me? You know I wanted to tape him." I am too stunned to answer at first. "You didn't hear him?" Pete shakes his head. "How close was he?" "It felt like he was just over my shoulder." "Aw, and I missed it..." And then proceeds to unzip the tent some more to look around. "He was right here." I insist. "Yeah, but he's gone." And he begins to exit the tent. Remembering where Macallan and I left out shoes, I quickly tell him that they are right outside the tent. "I'm not going to pee here." he tells me amused that I would think such a thing (hey, if I had to go just then, I would go right there!) As he steps out of the tent, he says, "I won't go far." Not needing even a flashlight with the full moon illuminating the night like a lampost, he takes a quick look around before returning to bed. The next morning we had to brake down camp, today would be our last day. I was exhausted from lack of sleep. Pete grills me for details and both kids can't believe I didn't wake them--as if I really wanted to experience that fright all on my own! Then monkeys distract us. At first there is only one, but as is the problem with monkeys, one becomes 2, becomes 10, 20, 30 in just a few moments. Several young monkeys climb on the trees above our tent and car. Once Markham pulls out an orange, they converge upon us, so we quickly leave. As we pull away from our camp site, we see large footprints. 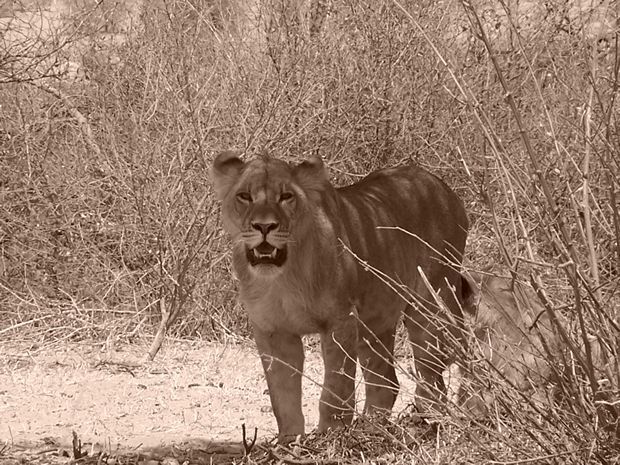 The lion did enter camp and was literally a few yards over my shoulder. Why didn't you wake us?, they all whine. I will never live this one down. I must truly be the most selfish mom alive! We go on one last drive down the riverbed. Dust storms whip through the valley. No great numbers of animals are seen. But large quantities of jackal and vultures lie around, too full to move off when we drive near. Apparently, there is a fresh kill nearby, but where? The many carcasses are old and obviously died from dehydration not from lion. 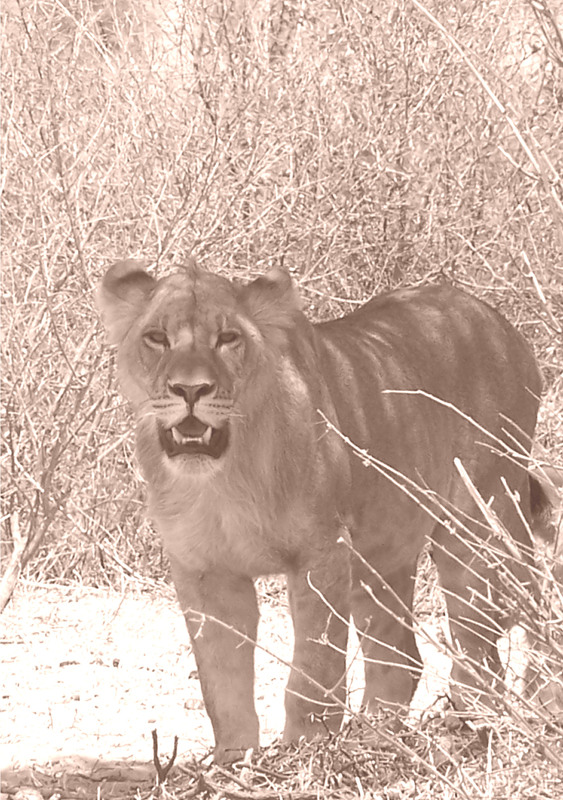 But everywhere the sense of danger and presence of these big cats can be felt. We drive some more and I refuse to let the kids out of the car to investigate this or that. There is still a lion here, I can feel it. As we go to leave, we head out of the riverbed, desolate where yesterday it was teaming with life. Peter makes a left instead of a right when we get to the top of the hill. We have not explored this area and this will be our last time in the "bush" before we go. We drive for a bit and spot things like weird congealed sap on an ancient tree. We see more skulls and try to identify them, arguing about one in particular. Turns out it is from a jackal and Markham is quite proud of his call. Then, Peter, surprising himself, nonchalantly points to two lionesses (young females) just behind a tree not far from the car. One gets up and appears to want to run, but decides we are no threat and lies back down. They both just look at us, open their mouths to yawn and stretch, but never take their eyes off us. A slight twitch of tail tells us that they are getting annoyed. It is a hot dusty day and they were comfortable. Not wanting to disturb them, we back away and drive out of the park. We head to Maun where we spend the next day catching up with friends, saying good bye, making new contacts and buying last minute must-haves--like a zebra rug to commemorate our anniversary, a tall wooden giraffe that we've resisted buying because it was cliché, a few pieces of hand-painted fabrics that I will be marketing in the States...but the whole time the idea that we will not be sleeping under these stars, with a lion's roar to lull us and frighten us to sleep, or wondering what we took for granted and what we'll miss the most, was ever present. Oh it's time to leave alright, and while we may go halfway around the world, we really won't be too far...far from the best of Botswana--her wildlife, her beautiful unspoilt wilderness and her call of the wild forever reverberating within us all.